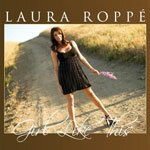 CD review: "Girl Like This"
Poway's Laura Roppe had quite a 2008: Coming in second in the New Country 95.7 local talent competition and issuing her debut CD. Roppe has a rich, expressive voice, and a confident delivery on this collection. She wrote all 12 songs, and the second track, "Mama Needs a Girls Night Out" is clearly aimed at country radio stations looking for the next big thing. It's a nice, hook-laden pop-style "new country" song  radio friendly, and with lyrics any suburban mom in her 20s or 30s can relate to. Roppe can also stretch out from contemporary Nashville sounds. "Float Away" is pure pop, with hardly a hint of country  closer to, say, Wendy Waldman or Laura Nyro. "Free" is pure rock 'n' roll, and "Fly Fly Fly" has a '70s folk-pop groove to it (think the McGarrigle sisters). Her backing band here is tight and professional (Dennis Caplinger plays just about everything stringed on this album), the production is as good as what you'd get on a release from a major label. While about half of Roppe's songs are first-rate, some of the others aren't quite as good  if she gets her songwriting down on a more consistent basis, Roppe could be headed for the national scene.